Facing a deadline, I’m at a loss for how to write a coherent review of Why We Fight. It’s not because I have nothing to say. On the contrary, I have about eight pages of notes from two viewings of the film, not to mention four pages of notes from a 30-minute interview with director Eugene Jarecki. My problem is where to stop. So Why Do We Fight? Why We Fight is a dense documentary that explores why America is at war in Iraq, and why we’ve been at war every decade since Eisenhower left office. Jarecki does the obvious by asking everyday Americans why we fight. “Freedom” is an easy response that many people give. But Jarecki shows us that there’s something more to the answer than that, and even persons-on-the-street will give you a more thoughtful answer if you give them time. Thankfully, most of the subjects interviewed in Why We Fight are a little more knowledgeable than your average American. Chalmers Johnson, formerly of the CIA and author of several books on foreign policy comes across as the most informed and informative of the bunch. Thinkers like Richard Perle and William Kristol of the Project for a New American Century add their weight to the documentary. 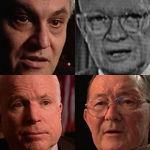 A former Pentagon employee, the secretary of the air force, Senator John McCain, and a host of others add their point of view to the question of why America fights. Running the length of the film are the words of President Eisenhower, whom Jarecki says was prescient in warning America about a “military-industrial complex” that could easily grow too big for Democracy. Balancing the wonkiness of political thinkers are some “human interest” stories. The best is that of a former NYC police sergeant, Wilton Sekzer, who lost a son in the September 11 attacks. Sekzer was a strong supporter of the Bush administration for years, and he believed that the war in Iraq was a just retaliation for September 11. When Bush was finally forced to admit, in 2003, that Iraq had nothing to do with September 11, Sekzer woke up to reality. His sense of betrayal by the president is as strong a statement against the war as any on film. Jarecki also introduces us to William Solomon, a 23-year-old New Yorker who has recently lost his mother. He’s looking for structure, support, and direction, and the Army is only too happy to provide all three. We also meet the two pilots who “fired the first shots” of the war in Iraq. Both B-2 bomber pilots go on camera to tell how exciting it was to be the first to use their smart weapons against America’s newest enemy. Perhaps the strongest scenes in Why We Fight come when Jarecki shows us what happened after the B-2s dropped their laser-guided bombs. Footage from the ground in Iraq shows that the “smart” bombs weren’t so smart after all. American TV news show that “one weapon clearly missed,” while the other landed just outside of the target area. Iraqi hospitals show that only 1 in 10 of the wounded were military personnel. The other 90% were civilians. Americans so rarely get to hear the damage being done in our name in Iraq. Finding out just how badly our “smart” weapons perform and just how much damage we’re doing to civilians is a maddening, frustrating exercise in futility. A kinder film might end with a soothing balm, something that would assure audiences that all is well and that our government, though it has made mistakes in the past, is finally on the right track. Instead, audiences will have to settle for accepting some responsibility for what our government is doing in our names. If there is a silver lining, it is that the average American is smarter than politicians and pundits think — in fact, the average American is as smart as you are. Being an informed citizen is patriotic. Watching Why We Fight is a good first step.